This potato green tomato curry recipe is easy curry recipe. Tomatoes and potatoes cook fast so making this doesn't take a long time. You can make this in about 15 minutes, including chopping. There are many recipes where we use ripe red tomatoes. Green tomatoes are not so commonly used. 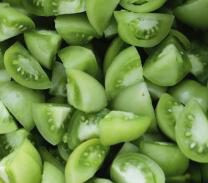 In fact many people do not like green tomatoes but I think that is because they do not know many green tomato recipes. In case you are one of them, I am sure you will start liking green tomatoes after you try this recipe. This curry uses very few spices, actually only one, but tastes great. Try out this potato green tomato recipe. Red chili powder - 1/2 tsp or according to taste. Heat a kadai(wok/deep pan) and add vegetable oil to it. When oil is hot, add hing, mustard and cumin seeds and let them splutter. When they stop spluttering, add curry leaves, turmeric powder and potato cubes. Mix and cover and cook on low flame for 2 minutes. Add chopped green tomatoes, mix and cover. Cook on low flame for 2 minutes. Add gud/jaggery, salt, red chili powder, about 1/2 cup water. Add the roasted and powdered peanuts and fresh coconut (if adding). Mix well and cook further till tomatoes are just done. Adjust the consistency according to your liking. Add a little water if necessary. Cook for another minute and add the chopped fresh coriander leaves. Take off fire and the potato and green tomato curry is ready to serve. Potato and green tomato curry can be served hot or at room temperature with plain rice, chapati, and poori, dosa and uttapam. Even though only red chili powder is used, this curry is yummy. This will keep in the fridge for 2 days. The quantity of gud / jaggery will depend on the sourness of green tomatoes. I like this curry to be a little on sweetish side. You may adjust according to your taste. For variation, you may add chopped onion. Add it as soon as the mustard and cumin seeds stop spluttering. 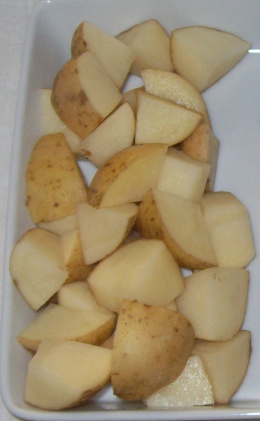 Fry till onions are transparent and then add the potatoes. I usually prefer to make this without onions. 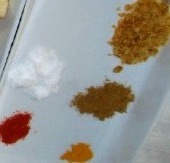 If you want it spicy, add 1/2 tsp garam masala or your favorite curry powder. You may also add 1/2 tsp roasted coriander and cumin seed powder. You may add chopped garlic or garlic paste. Instead of or along with roasted ground nuts (peanuts), add roasted and powdered sesame seed powder. That tastes great too.